I've written about the TechSmith Camtasia Library before. If you find yourself confused about the role of Media Bin (formerly known as the Clip Bin in older versions of Camtasia) versus the Library, check out this article on the IconLogic blog. I love Camtasia but have long lamented the lack of assets you get for free like you do with the Characters and eLearning Brother Assets found in Adobe Captivate 9, and the Characters and Content Library found in Articulate Storyline 360. Given the fact that Camtasia costs far less than either Storyline or Captivate, it's understandable that you don't get images and animations like you do with the other tools. If you want to see a preview of any of the Library assets, right-click and choose Preview. And as was true with older versions of Camtasia, to add a Library asset to the Timeline, simply right-click and choose Add to Timeline at Playhead. In the image below, I've added one of the eLearning Brothers motion graphics to my Timeline. 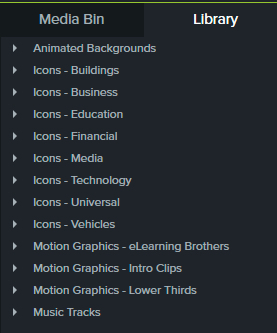 I love the fact that after adding, for instance, the eLearning Brothers Motion Graphics to the Timeline, you can click the plus sign to see the grouped elements that make up the asset and modify the individual pieces as necessary. If you're looking to get a quick start on using Camtasia, check out my upcoming Camtasia mini course. And if you'd like to learn how to use the tool on your own, my step-by-step workbook TechSmith Camtasia 9: The Essentials will help. The long anticipated Articulate Storyline upgrade was announced recently by Articulate and came not as Storyline 3 (as many expected) but rather in the form of the subscription-based Articulate 360, a suite of tools that includes every tool that Articulate makes. Articulate has decided to change the way upgrades to their products are going to work in the future. There will no longer be traditional upgrades to the licensed products that one has purchased and installed on their desktop. Upgrades will be made to the Articulate 360 tools. You can continue using the desktop version of Storyline 2 and Studio '13, but don't expect any future upgrades to these tools. With the new subscription model, you pay an annual fee of $999 ($599 for the first year if you are an existing Storyline or Studio customer). To edit existing projects, or create new content, you will need to keep your subscription active. Although the pricing seems a bit steep, consider what you get. For instance, there is a robust Content Library that has a vast array of professional templates and a huge number of characters and other eLearning assets. Other components include access to Replay 360 (a screen recording tool useful for making video demos), Rise (a template based online authoring tool for creating very simple and responsive courses), Articulate Review (online based course review process where many can comment and provide feedback), Preso (an iPad app that lets you create and annotate slides, add video and turn to a movie), and Peek (a desktop app that let's you record either Mac or PC screens). And of course there's Storyline 360, which is very similar to the current Storyline 2 in look and feel. However, there are some additional features in the 360 version. For instance, there's a major focus on support for mobile output by, among other things, making HTML5 the primary output and support for touchscreen and gesture interfaces. There is also a new dial control similar to a slider and a couple of new trigger events. One thing to think about before taking the plunge and going with 360 is backward compatibility--there is none. If you upgrade a project from Storyline 2 to 360, there's no going backward to version 2. This can be a major issue if you share files with other developers or content creators who cannot or will not upgrade from version 2 to 360. In the coming weeks I'll be showing you some of the ins and outs of the 360 tools I mentioned below. And keep in mind that if you need training or help with Articulate Storyline or Studio, we've got you covered with these awesome live, online Articulate classes. 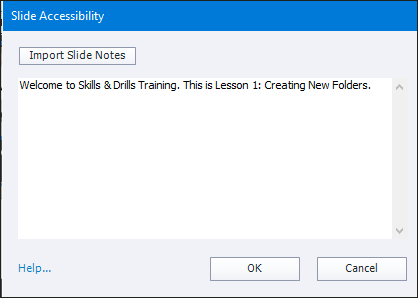 I received the following email last week concerning Adobe Captivate and accessibility. I’m using your Adobe Captivate 9: Beyond the Essentials workbook to learn how to make an eLearning module accessible and I have a question. Following this statement in the instruction below, you have us type what looks to be the script of the narration into the Accessibility dialog box. I am a bit confused by this. 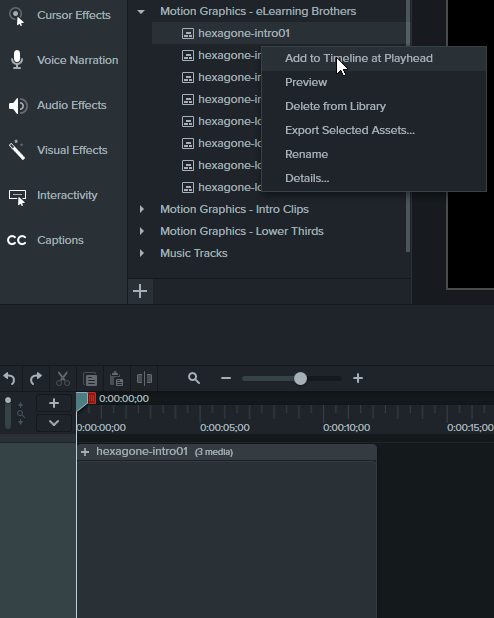 If my module includes a narration (voiceover audio) and closed captioning of the narration, what additional information should I include in the Accessibility dialog box? Do I also add the narration there too or do I simply add descriptive text only to explain what the image of the slide is? The developer's email above is referring a slide's Accessibility dialog box which can be accessed via the drop-down menu at the top of the Properties Inspector. Once the Accessibility dialog box is open, you can type anything you'd like, import the text from the slide notes, or copy/paste the text from an existing voiceover script. I am frequently asked why it's necessary to add Accessibility text if a lesson already has voiceover audio and closed captions. It's a great question. Keep in mind that closed captions are intended for a person with a hearing disability. If the learner has a visual disability, the closed captions aren't going to offer any assistance. Let's pretend for a moment that you are visually impaired. You will rely on a screen reader to read aloud what you cannot see. The voiceover audio, even if it features James Earl Jones, isn’t meant for you. In fact, the cadence of the words spoken by Mr. Jones would likely be sooo slowwwww you’d go nuts and probably fast forward through the lesson. Accessibility readers read at a much higher speed than most people without a disability can handle. It's a best eLearning practice that the Accessibility text be identical to the voiceover audio. When a hearing impaired learner accesses your content, most will mute the audio being used in the presentation (meaning they will not hear the Mr. Jones at all). Instead, learners will rely on the accessibility text (which is read aloud by a screen reader even if the audio is muted in the lesson).